As the Organizing Committee co-chairmen, we are proud and excited to invite you to Beijing for the Wharton Global Alumni Forum. We hope you can join us on June 12-13, 2009 and promise you will enjoy the time spent here. The theme of the Forum is "Global Crossroads for the 21st Century" and we are working to create a unique program that allows participants to connect in important political, economic and personal topics that are sure to be both stimulating and fun. In addition, the social aspect of the conference, such as our gala dinners, will be surely be great opportunities for our alumni and friends to network with new and old friends. We are sure you will share our sense of excitement with the prospect for intellectual stimulation, personal development, and the enlargement of our network and friends. All meetings with take place in combination at Ritz Carlton and JW Marriott in Beijing. 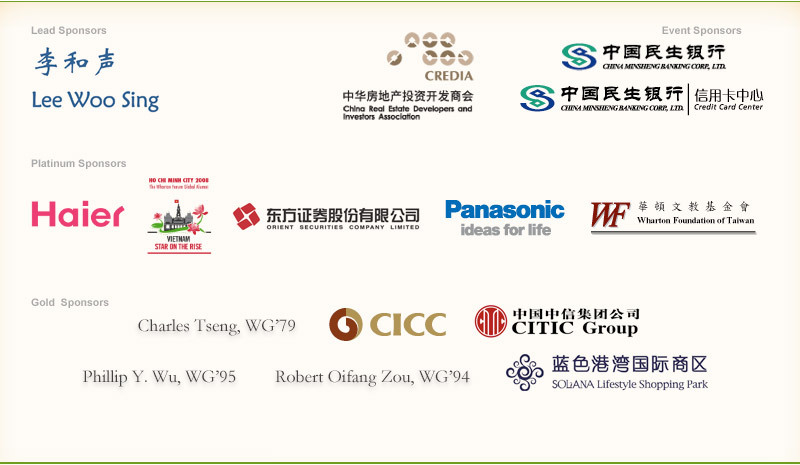 Additionally, we encourage you to extend your visit to China and explore the region after the Forum. We hope you may join us on June 12-13 and look forward to meeting you.